Kurogane tells Syaoran to blindfold himself and walk back to The Cat's Eye and that he can't take the blindfold off until he can recognize presences. While training, Syaoran notices that Oni have the presence of something which isn't alive. 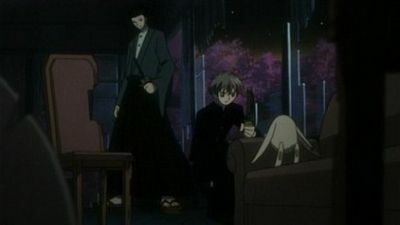 Kurogane and Fay leave Sakura at The Cat's Eye and go to talk to the lady that saw the new type of Oni. They find out that the Oni is created for the purpose of hunting. The new Oni seems to have Sakura's feather, and reveals himself to be Seishirō. The book of memories - it registers the memories of the first person to open it, and delivers the memories to the next person who touches it. 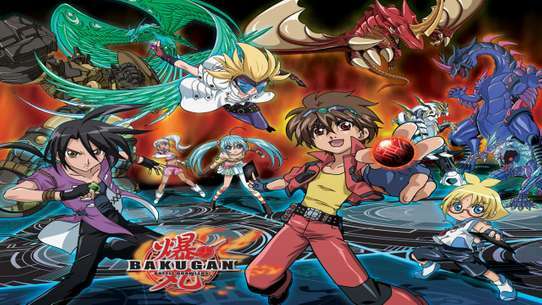 The group end up in a new world, Jade Country, where there is an old legend story about a golden haired princess who possessed a feather with magical powers and they are convinced that it belongs to Sakura so they go to a forbidden castle with a deep river surrounding it to try find some children that were abducted. 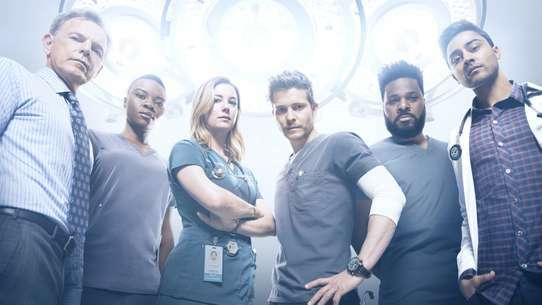 While they are in town, they are taking refuge in the house of a kind doctor, Kyle. But while everyone is asleep, Sakura sees the golden haired princess and follows her but then she is suddenly put to sleep. Now Sakura is getting the blame for taking the children and Syaoran is worried that she will never come back alive. Sakura continues racing in her dragonfly while avoiding obstacles. Meanwhile, using the sensor, Syaoran and Ryuuoh find out where the interference for the race is coming from. They head over to the Piffle Corporation Building and find that Tomoyo’s secretary is the one behind the sabatoge. When they arrive they find that he is about to shoot down Sakura’s dragonfly. Can Syaoran and Ryuuoh stop him? The statues of Ashura and Yasha continue to glow as the sky appears to crack, so Mokona transports Sakura and Syaoran to a different world, where they meet Ashura who appears to be in a war with Yasha. 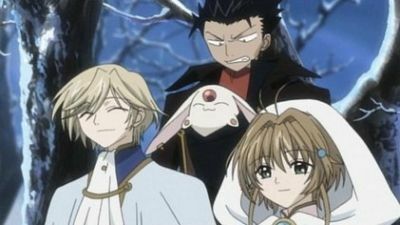 Sakura and Syaoran discover Fay and Kurogane (with black eyes), but are they the companions they have had all along? Sakura has a dream that seems to have told the past story between Ashura and Yasha. 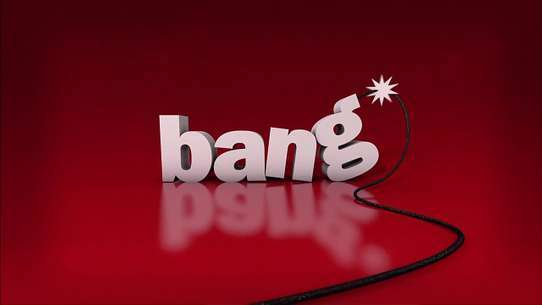 It seems the two are tragic lovers. Anyway Syaoran returns, but with many wounds and his eye begins to hurt. Sakura unconciously kisses it for him. Could this be something she did as memory from her body or something else? 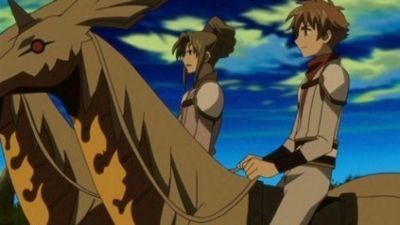 Syaoran goes into town with the king's most loyal soldier, Kumara, to look for the real Fay and Kurogane, but with no luck. Syaoran has an episode in town with his still hurting eye and visions of his double harbored in a glass case with our overlookers. Our mysterious overlookers are unhappy about the sudden world change mostly because they had nothing to do with it. 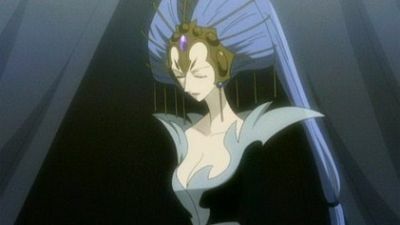 It seems Yuuko purposely made the world change as a favor to Ashura and also to stop the meddling of the overlookers. King Ashura decides to go back to the floating castle with just Kumara and Syaoran in her party to battle King Yasha and his underlings. 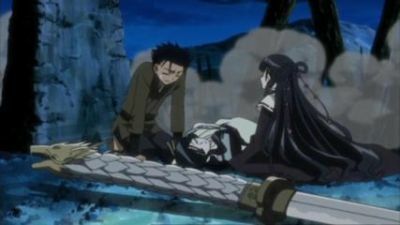 It seems King Yasha decided to travel lite as well with just this world's Fay and Kurogane. Just one attack seals King Yasha's fate as Ashura defeats him. 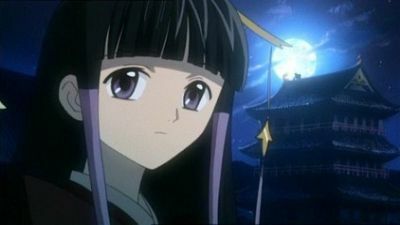 A glowing light emerses and as King Yasha's body disappears Sakura's feather appears. 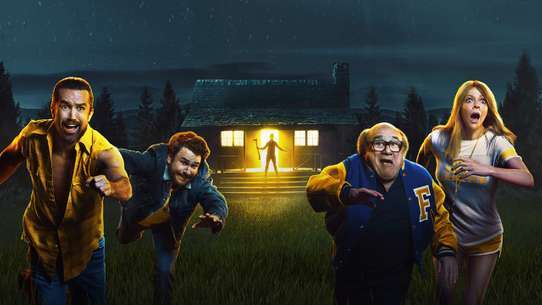 The gang end up in a world that looks like a desert. But when Mokona takes out the feather from the previous world, it got swiped by a truck! Syaoran and others board a bus to catch up with the truck and they see a familiar face! Chaos tell Syaoran about how there are more of Sakura's feather where they found the ones he had. 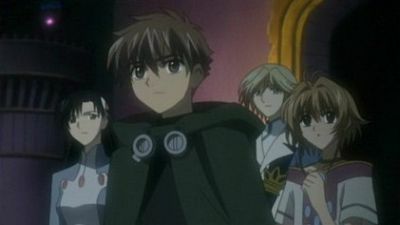 Syaoran decides to go find them and Fay and Kurogane join him leaving Sakura and Mokona alone at Chaos's Palace. The place Chaos told Syaoran turned out to be trap. What is Chaos planning to do with Sakura? Chaos had challeged Syaoran for Sakura. The winning gets to travel with her, but Syaoran's sword breaks during his previous battle. 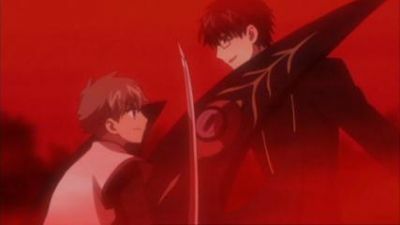 Kurogane trains Syaoran to master his sword. Will he be able to master Kurogane's sword and defeat Chaos and save Sakura once in for all? 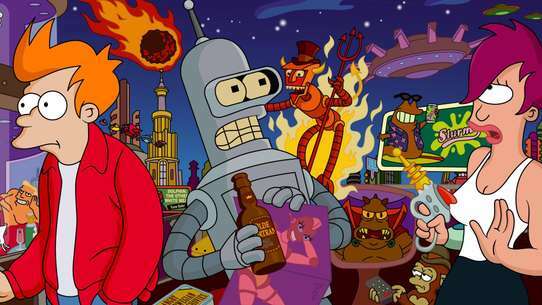 Our groups of friends end up in a world which is frequently visited by people from other worlds. After they learn they have to register, they are allowed to trade a few items they don't need for money. Then they get to choose an occupation. Fei chooses to be a bartender, Sakura chooses to work as a waitress, Syaoran and Kurogane choose a job that hunt random monsters. Will their temporary occupation bring them any closer to finding Sakura's feathers? After a strange dream, Syaoran wakes up in a futuristic world called Piffle and joins the others. After a chat with Yuuko, the group sets out to take part in the Dragonfly Race; the grand prize is one of Sakura's feathers! Nearly crashing into her, Sakura and the others meet Tomoyo Daidouji, the president of the Piffle Princess Company and hostess of the Dragonfly Race. 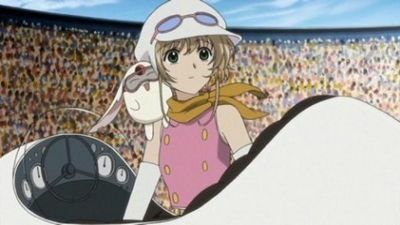 Tomoyo decides on Sakura as her heroine for the race; unfortunately, Sakura is not the best driver and she crashes more than once. 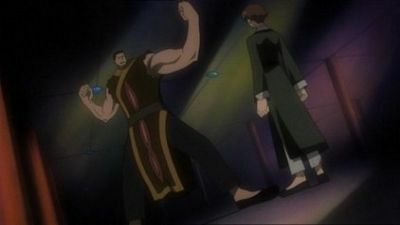 The villagers of Koryo storm the castle as Chu'nyan follows Sakura; meanwhile, Syaoran continues to battle the Ryanban's son and Fay and Kurogane continue to fight Kiishimu. Kurogane unintentionally frees Kiishimu from her imprisonment set by the Ryanban, by kissing her. Chu'nyan learns that her mother's spirit temporarily inhabits Sakura's body and Chu'nyan comes to understand the true meaning of hijutsu. Her mother gives her own hijutsu mirror to Chu'nyan and departs from Sakura's body. Syaoran wakes up inside an egg shaped pod. 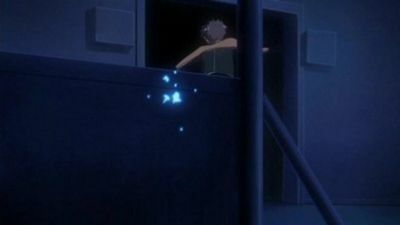 He hears a tapping on the glass and sees Fay there, smiling, and pointing to another pod which contains Sakura. Sakura then awakens too, and she and Syaoran get out of their pods and greet each other. Syaoran wonders where they are; the place they are in looks very different from the town. 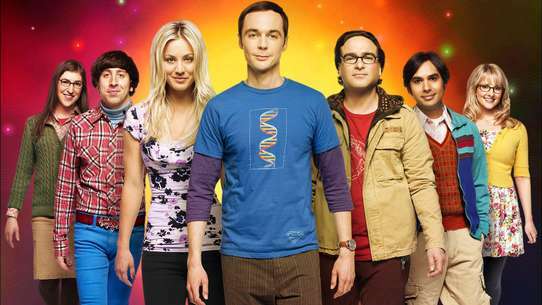 The group meet up with a woman whom Fay tells them can explain everything, and she does so. The world of Ōto is a virtual reality program in Fairy Park which is a popular game for the residents of the Edonis Country. Syaoran sees that Kurogane and Mokona are still asleep in their pods. The woman tells Syaoran that someone is interfering with the program. This person is trying to turn the virtual reality into actual reality. Kurogane, Mokona, Ryū-ō and the others appear. 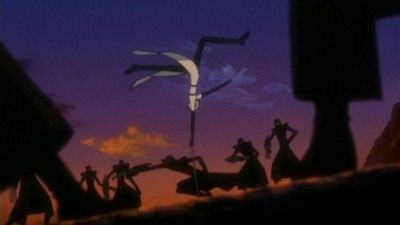 Seishirō then also appears and Kurogane fights with him. Before long, the true identity of the strongest Oni is revealed. 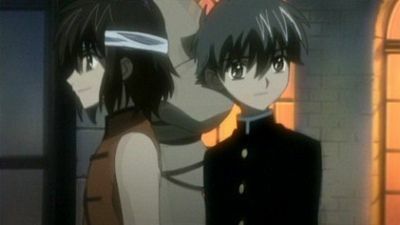 It seems Syaoran and Kurogane had stolen the prey of two demon slayer partners Yuzuriha Nekoi and Kusanagi Shiyuu as they introduce themselves Kurogane discovers from them that Fay and had given him and Syaoran the aliases Big puppy and Little puppy. Back at the cafe they treat the partners to some cake and tea while Kurogane huffs at Fay for the names (he and Sakura are Big Kitty and Little Kitty). 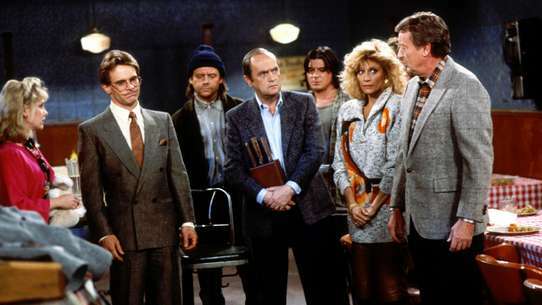 The partners get called out for a bounty so leave promising to come back and swap stories. 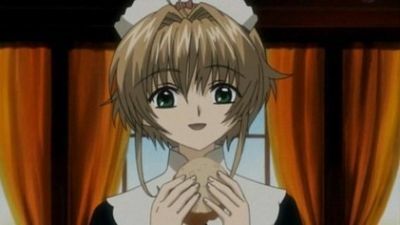 Syaoran and Sakura have a momentary heart to heart when Sakura almost discovers that Syaoran was probably an important person to her, but because of Yuuko's work she instantly forgets her discovery. Syaoran and Kurogan go down to city hall to find out about any strange occurrences when they are directed to the information booth. They meet a woman by the name of Eeri at the info booth who tells that lately demon have been showing up in areas they shouldn't and of a new demon that's appeared that takes the shape of a beautiful woman. 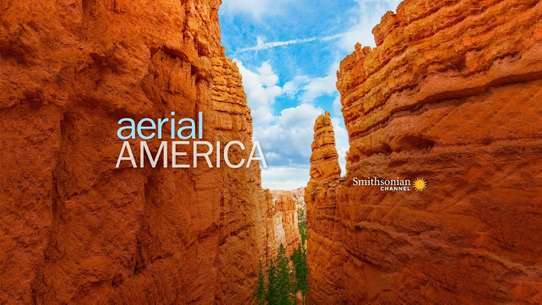 They receive an address to a place where to find more information. Kurogane and Fay follow the address when they are surrounded in the streets by a bunch of demon ready to attack. 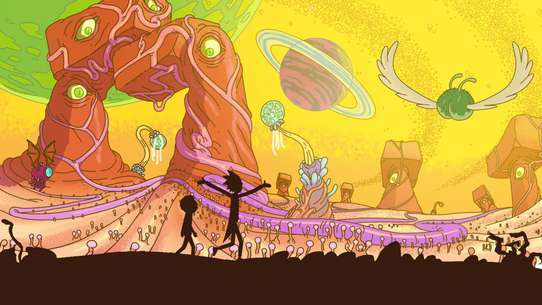 This episode starts directly from where the previous episode ended. 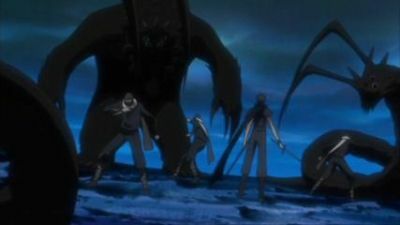 Kurogane and Fai battle the oni, which they manage to stay alive, though Fai's ankle is injured. New oni slayers show up in the store. The person that Kuro and Fai were directed to meet had just left the place. A stronger oni arrives on the scene, doing weird things once more. Syaoran is unable to do much, but the teamwork of the oni slayers takes down the oni. Fai and Kuro come back to give the bad news. At the end, Syaoran realizes that he cannot rely just on his kicking skills and ask Kurogane to teach him how to fight with a sword. The mystery man shows up once again, is he related to the weird incidents that has been happening lately? What about Sakura's feather? Syaoran comes across "the book of memories," well a copy of it. Kurogane opens it and finds that nothign is written inside of it. He hands the book to Syaoran who opens the book and finds himself looking at a younger version of Kurogane. Can this be Kurogane's past? As Syaoran, Fye, Kurogane, Sakura, and Mokona arrive to the next world Syaoran collapses of fatigue due to the previous battle. An elderly woman offers her home for them to rest and also tells them the story of the castle. She tells them that if they make it up there alive a wish will be granted to them, but many have tried and died. 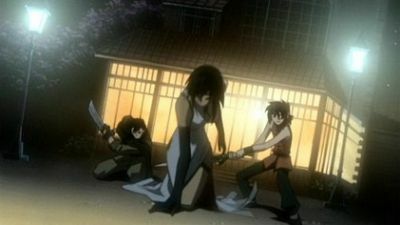 They decide to investigate and see if it is the work of one of Sakura's feathers. 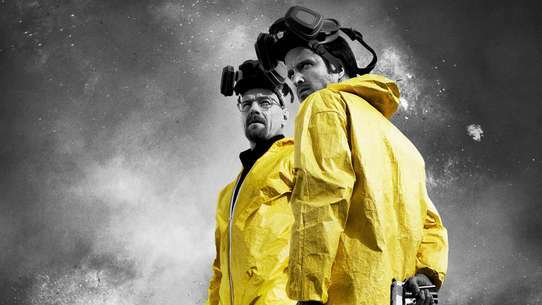 What will be their wish? The villagers tried to attack the Ryanban's castle and are now under his control. To make matters worse, Syaoran sees that Chu'nyan and Sakura are trapped in a bubble and learns that if he attacks the villagers, the girls will feel the effects tenfold. But his determination gives him an edge in the fight as he finds out that the girls trapped inside the bubble are not the real Sakura and Chu'nyan. 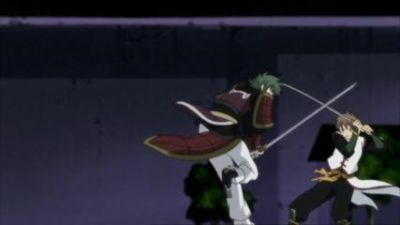 Seishirō attacks Fay after he asks if Kurogane and Syaoran live there. It is revealed that Seishirō gave his right eye to Yūko to obtain the power to travel between dimensions but unlike Mokona he can only use this power a limited number of times. Fay gets cornered and is defeated. Seishirō uses Sakura's feather and the people in the world start disintegrating like a computer program. When Syaoran and Kurogane get back to The Cat's Eye they find out that Fay was defeated by an Oni and that Sakura may have been taken captive. When Syaoran finds Seishirō and asks him what happened to Fay, he tells him that he killed Fay. 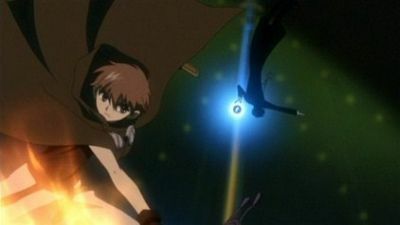 Seishirō stabs Syaoran in the chest with a weapon made from Oni. Syaoran starts disappearing but then Sakura comes running out and hugs him and they both disappear. 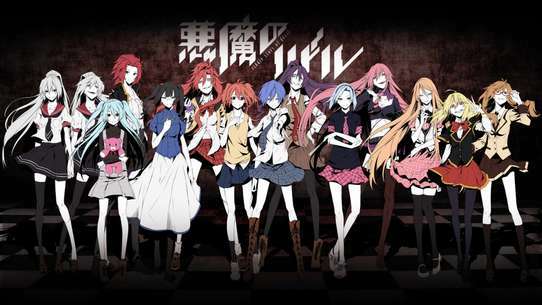 The fight between the group and the Oni continues, while Seishirō is told the real truth behind everlasting life in the game. 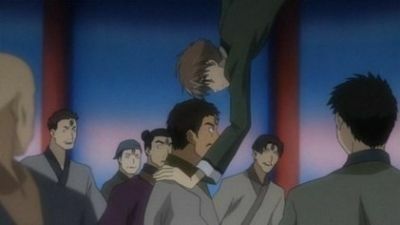 Syaoran climbs to the top of the rollercoaster and tells Seishirō that he doesn't think he will be able to beat him in his current state. 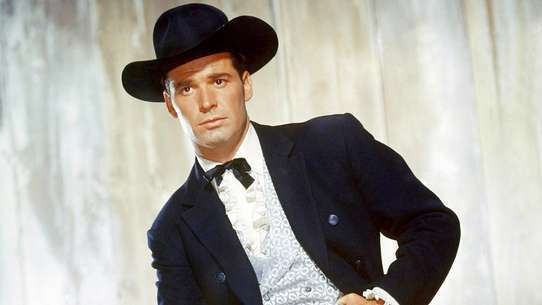 However, he has decided to get the feather back; so he draws his sword even though he knows he's not quite ready yet. When he draws the sword, it bursts into flames and the fight begins. Seishirō takes off soon after the fight begins, but as he leaves, the Oni are left behind for them to take care of. 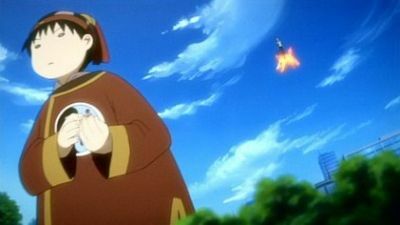 After finishing them off, Mokona reacts to the power of the item Seishirō used and takes the group to the next world. 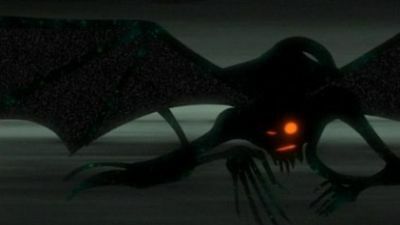 It is revealed that the Ryanban has a secret weapon which is in the form of a mysterious witch, named Kiishimu. Syaoran is still determined in getting into the castle that has Sakura's feather inside. Though he was hurt from the previous battle, he still plans to go inside. Fay and Kurogane decide to storm the castle even when Chu'nyan tells them that powerful secret arts protect it. 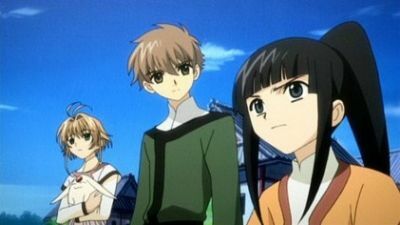 Chu'nyan, Syaoran, and Sakura visit the resistance in town against the Ryanban. Sakura is drawn towards the castle and mysteriously disappears inside. Syaoran goes in after her and there they meet all the townspeople that have been imprisoned and have changed into monsters. Sakura and Syaoran are then back in front of the gates of the castle because of a mysterious presence. They tell the villagers what happened to the others sucked in from the gate. 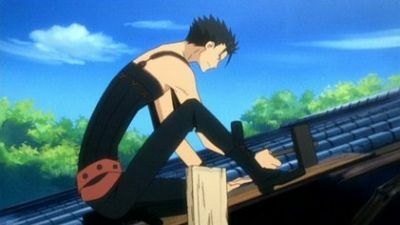 Kurogane and Fay decide not to storm the castle but to think of another method. 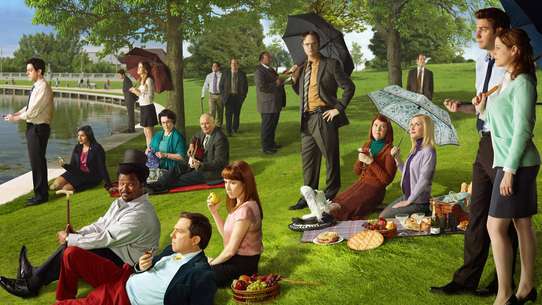 The villagers decide to fight once more. A mysterious power within Sakura is awaken by the ruins as wings sprout from her back. Sakura beings to fade into the seal but Syaoran saves her. However, the wings break as the feathers scatter to many different worlds. Syaoran carries Sakura, now unconsciouses and her life fading away, out of the ruins to find themselves being attacked by mysterious mechanical warriors. Touya manages to keep them back as Yukito finds that Sakura's heart is no longer in this world. With no other choice, Touya leaves Sakura to Syaoran and Yukito sends the two to another world to seek help from the Dimensional Witch. 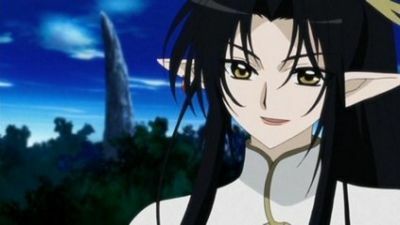 Now in the world of XXXHolic, Syraoran is joined by Kurogane and Fai as he pleads to YÃ»ko to save Sakura. Syaoran and Shogo begin their unfinished fight. 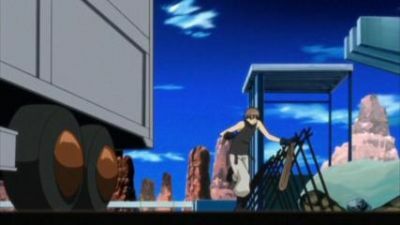 As the fight continues in Syaoran's favor, Masayoshi and Primera are in danger as a result of their fight. However, Masayoshi's Kudan saves them but grows to a tremendous size as Mokana senses that Sakura's feather is in Masayoshi's Kudan. 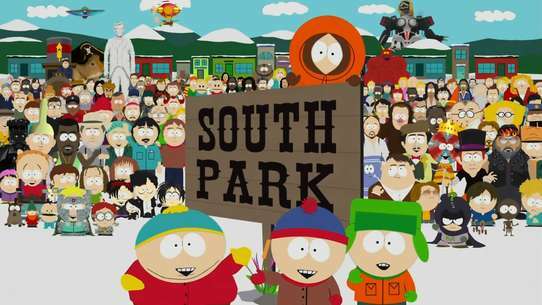 Arriving in the next world, Syaroan and the gang get harassed by the son of the lord there and his thugs. Shortly after, they meet a young girl by the name of Chu'Nyan who chasses the thugs off. When the son runs home to his father, we realize that his source of power is one of Sakura's feathers inclosed in a ball. 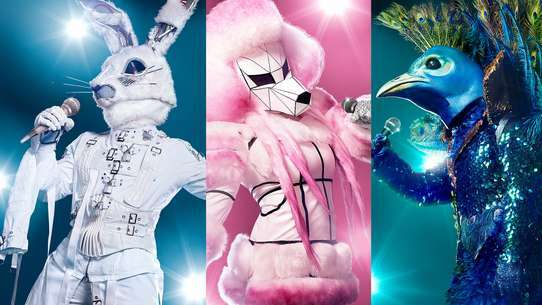 Due to the wierd clothing that Syaroan and co. are wearing, Chu'Nyan then mistakes them for Mitteishu, or secret investigators from the government sent to the many kingdoms to right wrongs, and takes them to her house. After a long talk with them, she realizes that they couldn't possibly be Mitteishu she tells them about the evil lord of the area and how he murdered her mother. 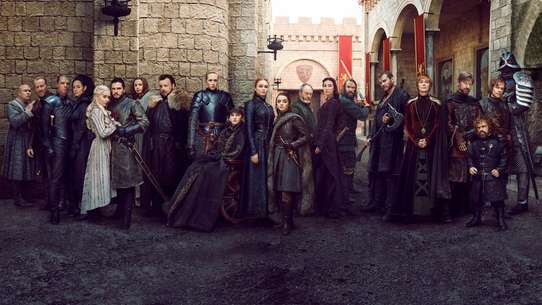 Later on, the young lord and his thugs burn down a townspersons house because they didn't pay their taxes. After a fight between them and Syaroan, Chu'Nyan only keepsake from her mother, her magical fan, ends up getting destroyed.